Kubiak’s Club. With his win in Super Bowl 50, Gary Kubiak became a member of an exclusive club that also includes another member of the National Polish American Sports Hall of Fame. Kubiak joins 2001 inductee Mike Ditka, as well as Tom Flores, as the only men to win a Super Bowl as a head coach with the same team that he once played for. Kubiak also joined another club that only he is a member of: he is the first person to have played in the Super Bowl and later win it as a head coach, both with the same team. Gary Kubiak has had a remarkable career in professional football, which included leading the Denver Broncos to victory in Super Bowl 50. While he has received many accolades for his accomplishments on the gridiron, off the field he has earned an equally impressive reputation as a husband, father and man. Appearing on the ballot for the first time, Kubiak was the leading vote-getter for the National Polish-American Sports Hall of Fame in 2017 in the Major Sports category. Kubiak’s ancestors settled in Texas from Poland in the late 19th century. After the Civil War, the small city of Bremond, Texas began recruiting laborers from Poland to work the cotton plantations. In the 1880’s Gary’s great grandfather, Michal, came with his family from the Poznan area of Prussian-occupied Poland to Bremond, where other family members had settled. Bremond was once the largest Polish settlement in Texas, still celebrates its Polish Festival Days every June. Gary was born on August 15, 1961 in Houston. An outstanding athlete, he passed for a then state-record 6,190 yards as a quarterback for St. Pius X High School of Houston. He was twice named to the all-state football, basketball, baseball, and track teams before graduating in 1978. He would later be inducted into the Texas High School Football Hall of Fame. It was in high school that Gary met his future wife, the former Rhonda Kaminski. The high school sweethearts would get married after college, just before Gary started his pro career. Kubiak attended Texas A&M University and was named All-Southwest Conference after leading the conference in passing yards (1,948) and touchdowns (19) in 1982. As a junior, he set a conference record by throwing six touchdown passes against Rice. In his four seasons with the Aggies he passed for 4,078 yards and 31 touchdowns. In 1983 Kubiak was selected by Denver in the eighth round of the NFL Draft. That same year John Elway was the overall number one pick in the NFL, chosen by Baltimore before being traded to the Broncos. Elway became a star, and Kubiak mostly served as Elway’s back-up from 1983 to 1991. Kubiak was not only a valuable reserve, but he and Elway worked closely together in game preparation. Kubiak’s keen understanding of the game led many to predict that he would be a future head coach in the NFL. Over his career Kubiak threw for 14 touchdowns, 16 interceptions and 1,920 yards, and went 3-2 as a starter. He was a contributor to three AFC Championship teams. Gary did go into coaching in 1991, returning to his alma mater to serve as Texas A&M’s running backs coach for two seasons. Kubiak then went to the San Francisco 49ers as quarterbacks coach under offensive coordinator Mike Shanahan. It was in that capacity that he won his first Super Bowl, helping quarterback Steve Young to one of his finest seasons. Young not only earned his second NFL MVP, but also won Super Bowl XXIX MVP honors by throwing for a Super Bowl-record six touchdowns in San Francisco’s 49–26 win over the San Diego Chargers. When Shanahan was hired by Denver as the Broncos’ head coach in 1995, he brought along Kubiak as the team’s offensive coordinator and quarterbacks coach. They turned the franchise around almost immediately, and the Broncos went on to win back-to-back Super Bowl championships in the 1997 and 1998 seasons, the last two seasons of Elway’s playing career. Kubiak served as Denver’s offensive coordinator for 11 seasons, during which his offense accumulated 66,501 total yards and 465 touchdowns, the most in the NFL during that period. In 2006 the former Houston Oilers ball boy returned to his hometown as the second head coach in Houston Texans history. 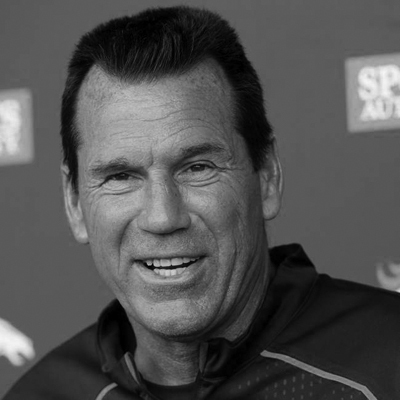 Kubiak soon gained a reputation as a very prepared and knowledgeable head coach with a low-key approach, but also as a person of high character who communicated honestly with players and coaches. Even members of the media found him refreshingly open and forthright. By his second season the Texans had their first non-losing record in team history, finishing 8-8. In 2011 the team went 10-6, winning its first divisional crown and beating Cincinnati in the wild card game 31-10. Houston then lost in the divisional playoffs to Baltimore, 20-13. The 2012 season saw the Texans start 5-0 for the first time in the franchise’s history, en route to a franchise-best 12-4 record. They again beat Cincinnati in the wild card round, but lost to the New England Patriots 41-28 in the divisional round. After winning the first two games in 2013, Houston lost five in a row before going to Indianapolis on November 3rd. Houston went into halftime with a 21-3 lead when Kubiak collapsed while walking off the field. It turned out that Kubiak had suffered a transient ischemic attack, or mini-stroke. He was taken to the hospital, and the Texans lost the game. He missed one game and returned to work eight days later on a modified schedule. In December, with three games remaining and the team at 2–11, he was fired. Afterwards Kubiak issued a statement thanking the organization, especially the team’s owner, for giving him his first head coaching job. He also placed a full-page ad in the Houston Chronicle thanking fans. Kubiak then went to Baltimore in 2014 as offensive coordinator, where his tremendous success re-tooling the Ravens’ offense made him a highly sought-after head coaching candidate. However, Kubiak didn’t seem interested in taking on a demanding head coaching job until he got a call from his old friend and former teammate, John Elway. Elway, who was then the Broncos’ top football executive, offered him what Kubiak he called his “dream job” – head coach of the Denver Broncos. In his first season Kubiak led the Broncos to a 12-4 record, winning the AFC West and securing the number one playoff seed in the AFC. They knocked off Pittsburgh Steelers and New England Patriots to advance to Super Bowl 50, where they defeated the Carolina Panthers 24-10. In his first season as head coach, Kubiak had led the team he played his entire career with to the league championship. With the retirement of quarterback Peyton Manning, the Broncos fell to 9-7 in 2016 and missed the playoffs. During the season Kubiak spent a night in the hospital after an October 9th loss to Atlanta, and was diagnosed at that time with a “complex migraine condition.’’ He did not coach the team in next game, but returned the following week. After the final game of the season Kubiak surprised observers by announcing that he had told his team that he was stepping down due to health concerns. “I’m not sure what my future holds, but I know that I’ll always consider myself a Bronco,” a tearful Kubiak said. Kubiak’s players had a lot of respect for their coach’s football knowledge and personal character, so many were in tears as well when they heard the news. Bronco’s safety Darian Stewart said: “This one hurts. Yeah, this one hurts bad. If you ask any of these guys in here, they’ll tell you Kubes is the best head coach they’ve played for without a doubt.” All-Pro linebacker Von Miller later wrote a lengthy tribute which read, in part: “For him, coaching is an all-or-nothing deal, and he’d rather walk away than offer less than his best.” Even the reporters clapped for Kubiak after he made his announcement. A Good Husband and a Good Father Kubiak once said that he acknowledged coaching a pro football team was a big responsibility, but added, “Really, my two biggest responsibilities in life are to be a good husband and be a good father.” He always found time for his three sons, Klint, Klay, and Klein. Not surprisingly, all three played college football. We don’t know what the future has in store for the 55-year-old Kubiak, but we do know that he has had a great career as an NFL player and coach and a man of great integrity who has enriched the lives of those around him. Gary and Rhonda Kubiak met while sitting near each other during their freshman year of high school. The seats were assigned alphabetically, and since Rhonda’s maiden name was Kaminski they were in close proximity. Gary asked her to the homecoming dance and shortly after they began dating. They became high school sweethearts and the perfect high school couple: Gary, the star quarterback, and Rhonda, a cheerleader. Gary and Rhonda were married in June 1983, less than three weeks before he left for Broncos training camp. Together they raised their three sons, Klint, Klay, and Klein.